Last week in a domestic dispute in Chula Vista, California, a woman driving a car repeatedly tried to hit a man on a motorcycle. The fight carried out across multiple city blocks until police arrived and arrested the man for alleged domestic violence and stealing the motorcycle and the woman for alleged assault with a deadly weapon. No police officers were physically there to witness the crime. Instead, a drone using Cape telepresence hovered above the scene, recording video that will be used as evidence in court, Chula Vista Police Department Captain Vern Sallee told VentureBeat in an interview last week. “We were able to divert other resources to this now very high priority call and potentially save this guy’s life and obviously get two people in custody, recover a stolen motorcycle, and ensure public safety,” he said. 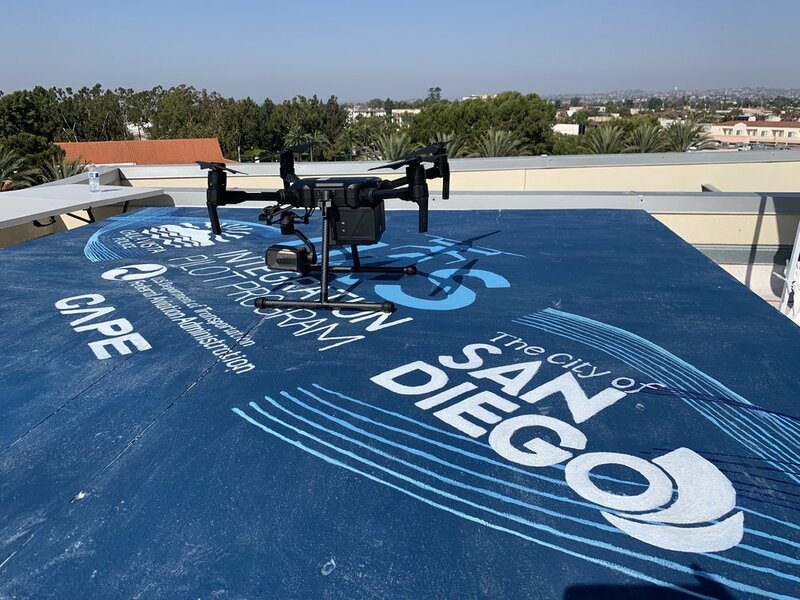 The incident is the most recent case in a trial drone first responder programbeing taken on by the telepresence drone piloting company Cape and the Chula Vista Police Department. Since then, drones piloted remotely by police officers assisted in 21 arrests, spanning 249 flights over the course of 81 flight hours. Cape is also testing drone usage with the San Diego Fire Department. The experiments are part of the U.S. Federal Aviation Administration’s (FAA) Integrated Pilot Program to test drones for a range of use cases in communities across the country, which began last year. Other participants in San Diego, the largest city in the country participating in the program that required a regional government sponsor, include UC San Diego Health to deliver blood and medical supplies, Uber Eats for food deliveries, and AT&T to test 5G networks. The first responder concept means drones are not deployed after a crime occurs, but proactively deployed for a large number of scenarios. In almost all instances, Sallee said, the drones gets there before officers in vehicles on the ground. The pilot program is currently limited to a one-mile radius around headquarters in downtown Chula Vista, the area of the city most likely to make 911 calls for police. Police drones in 2 minutes or less? With 270,000 residents, Chula Vista is the second largest city by population in San Diego County and one of the 100 largest cities in the U.S., but Chula Vista doesn’t have a manned helicopter unit like the nearby San Diego County Sheriff’s Department and San Diego Police Department do. Helicopter support can be requested from neighboring law enforcement agencies, but only in extreme cases and only if it’s available. Following three months of testing, Sallee wants drones that are able to deploy from boxes then return to recharge on top of Chula Vista’s soon to be 11 fire stations in order to respond to any call for service in two minutes or less for use by police, fire, and medical emergency responders. Unlike helicopters that are selectively deployed by human-operated helicopters, Chula Vista plans to launch drones for routine calls that would never get a helicopter, like a car accident or domestic dispute. “The routine calls are the calls that often go sideways on us without you ever expecting it,” Sallee said. Conversations are ongoing between CVPD and the FAA to extend trials beyond a physical line of sight obligation that requires stationing an additional officer on the roof. Under current FAA guidelines, even though the Chula Vista Police Department is participating in the IPP program, the officer in the watch commander’s office must work alongside an officer on the roof of the police department in case another aircraft enters the drone’s airspace. Despite the fact that the experiment has taken place in a small section of a city that’s 52 square miles, Sallee says it’s changing how they do their jobs. In the past week, for example, drones have cleared half a dozen 911 calls without the need to send police to the scene. In other instances, early drone deployment has helped provide police with context through live video feeds or information added to the computer-assisted dispatch. Drones providing live video allow a watch commander to decide whether a car accident call with few details no longer requires assistance, or if things have gotten out of hand and more assistance is needed. Real-time results also mean supervisors to play a role in determining how to address a given situation. Should Chula Vista police get their wish and deploy drones throughout the city, they won’t use facial recognition software — at least not initially, Sallee said. Police drones in Chula Vista will operate with a hybrid combination of automation and human control. Automation can handle routine flight control, avoid flying objects and buildings, and maybe even fly to the scene of the crime, but once the drone arrives, a police officer should pilot it in order to get the right camera angles and prioritize based on the context of the incident. Beyond facial recognition software, there’s a series of computer vision systems that police may someday deploy, including the kind used to identify the bulge of a hidden weapon or alert authorities when a suspect is carrying a gun. Object detection to identify weapons was used in trials Cape carried out with the police department in Ensenada, Mexico.